The Carnegie Hill CSA (Community Supported Agriculture) is a member-based organization that works with local farmers to distribute their high-quality, freshly-picked produce and artisan products. Membership was down and the website needed to be updated. Allow present members to quickly access information on their mobile devices. An online survey was sent to members. A series of User Personas were developed to better understand the type of people who are attracted to the CSA. This included looking at members’ behaviors, attitudes and how they spend their time. Interview people not familiar with a CSA. 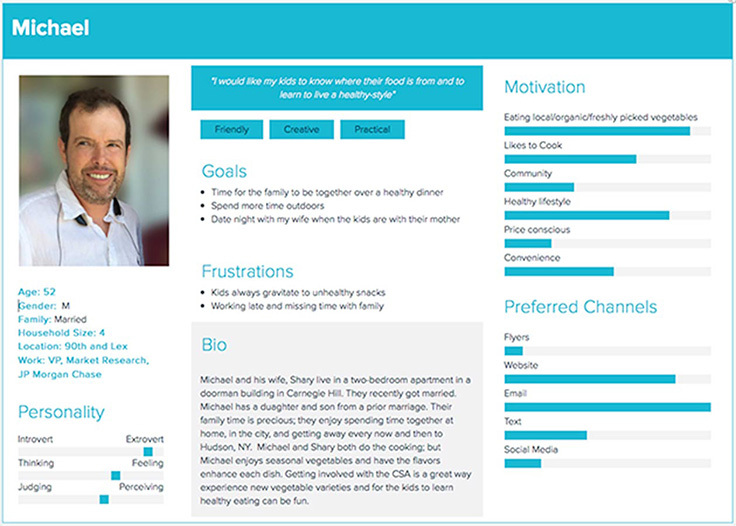 Based on the UX research, a wireframe was developed and tested on members and nonmembers. Members are relieved that they can now quicklyaccess needed information on their mobile devices. The bounce rate of the new website dropped, meaning more people were engaged and visited multiple pages to learn about the CSA. Since this was Manhattan, 95% of the members of the Carnegie Hill CSA live within a 5-10 block walking range of the distribution site. A great way to target the people living in this radius is use Every Door Direct Mail. You pick which postal routes, create a postcard and the U.S. Post Office delivers to every resident on that route at minimal cost. The front of the postcard was all about the location and pictures of the beautiful produce. The back gave more information about the benefits of joining a CSA.